What do you do when part of your body itches? You scratch. Why? That is because it feels good. Why does it feel good? It’s the intrinsic nature of the senses. When a man cares about his nation, he will speak or do something to protect the interest of that nation. That too is the intrinsic nature, of a patriotic man. And when he sacrifices his life for the nation, he is called a hero. Under the vast open skies with limited lands, only Hun Sen has the thickest skin that itching cannot penetrate. That is the intrinsic nature of a senseless being, the dumbest of the dumb. Allowing barbarians to gobble up the lands and remains silent is the characteristic of a puppet, a worthless human. What is...is that my Khmer people think that[Culture of Dialogue] is so important without raising an issue of Kampuchea Krom. That's quite bizarre! 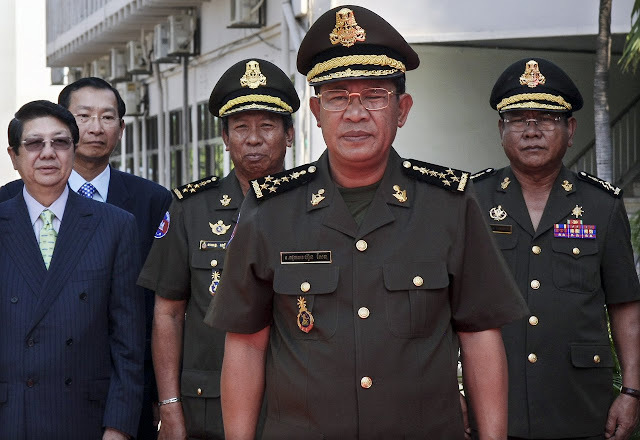 If Sam Rainsy and Hun Sen are thus patriotic or jingoistic, their conversations should include Kampuchea Krom at all times; I mean not to be [Culture of Symbiosis]. ...I let School of Vice finish this story! I never consider for a moment that the Khmer Krom loss to Vietnam. But I do consider that the Khmer Krom is still under occupation of the Vietcong government! For those people including Thach Setha to accept the loss of Khmer Krom to Vietnam is to accept the Vietcong government oppression of more than 10 million Khmer Krom people! No people want to live in oppression! So the debate, the discussion will go on and on until the Khmer Krom people are free people! The Khmer Krom people never loss! The Khmer Krom people are being oppressed by the Vietcong government! Say no to Vietcong oppression!